Description: This is a high quality timothy alternative diet to alfalfa based chinchilla pellets. Some owners and chins prefer pellets that are lower in protein and calcium due to either preference or dietary restrictions imposed by certain medical conditions. The Mazuri Timothy pellet is highly palatable and provides complete nutrition, we are very excited to be able to offer these pellets to our customers. 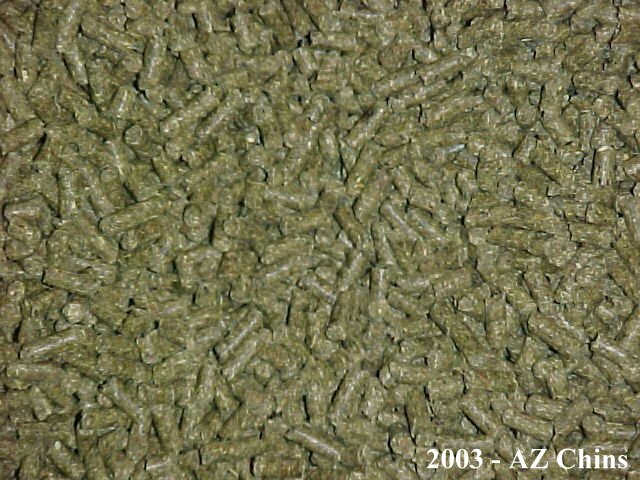 We know the mill date on every bag of pellets, so the pellets are always fresh unlike many petstore brands of pellets. Mazuri uses quality ingredients with a quality control program that ensures pellets of consistent nutrition and quality. Amount Needed: Most chins eat about 2 to 2.5 pounds of pellets each month. When ordering only buy about 3 to four months worth at a time. You will learn over time how much your chinchilla(s) will consume every 1 to 4 months and figure out what to buy. If you don't know how much to order, use the simple guide below. Ingredients: DEHYDRATED TIMOTHY, GROUND SOYBEAN HULLS, WHEAT MIDDLINGS, DEHULLED SOYBEAN MEAL, GROUND OAT HULLS, CANE MOLASSES, GROUND BEET PULP, FLAXSEED, LIGNIN SULFONATE, SOYBEAN OIL, SALT, CALCIUM CARBONATE, DICALCIUM PHOSPHATE, CHOLINE CHLORIDE, DL-METHIONINE, BREWERS DRIED YEAST, DRIED YUCCA SHIDIGERA EXTRACT, MAGNESIUM OXIDE, VITAMIN A ACETATE, FOLIC ACID, CHOLECALCIFEROL, PYRIDOXINE HYDROCHLORIDE, D-ALPHA TOCOPHERYL ACETATE, CALCIUM PANTOTHENATE, NICOTINIC ACID, RIBOFLAVIN, DRIED LACTOBACILLUS ACIDOPHILUS FERMENATION PRODUCT, DRIED ENTEROCOCCUS FAECIUM FERMENTATION PRODUCT, VITAMIN B-12 SUPPLEMENT, MANGANOUS OXIDE, ZINC OXIDE, FERROUS CARBONATE, COPPER SULFATE, ZINC SULFATE, CALCIUM IODATE, COBALT CARBONATE, SODIUM SELENITE.